In honor of Saint Brigid, our family, along with a close friend, hosted coffee hour at church. 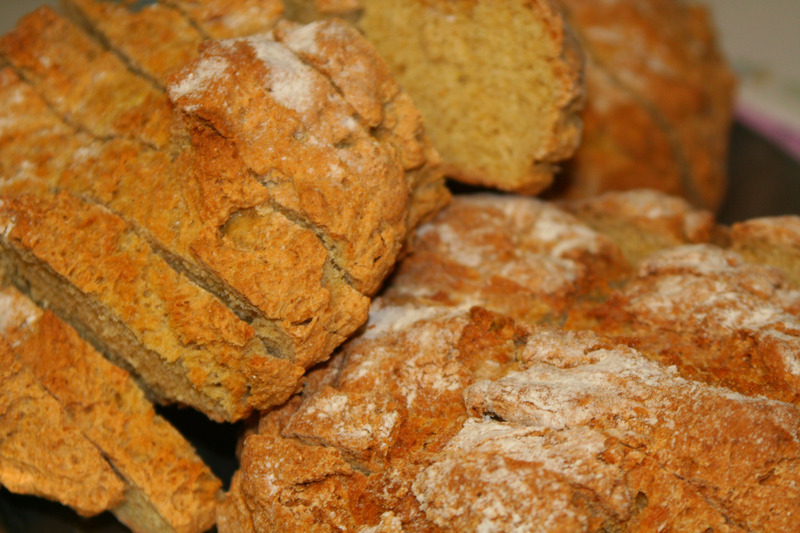 We decided we would serve dark Irish soda bread, tangerines, nuts, butter and creamed cheeses along with the coffee, tea and juice. At first I was planning on making about ten loaves. But, after speaking with my friend, and learning we were meant to feed over 200 people, I revised my baking plan, bumping the number of loaves up to twelve. The co-pilot stumbled into the kitchen at 6 am, looking sheepish. Did the alarm clock go off? That’s when we had a pow wow about the amount of bread we were baking–how in the world we were to feed all the five thousand–and this prompted him to drive to the market in his PJ’s for more ingredients. I mixed furiously. Pantry, which the Lord has blessed. 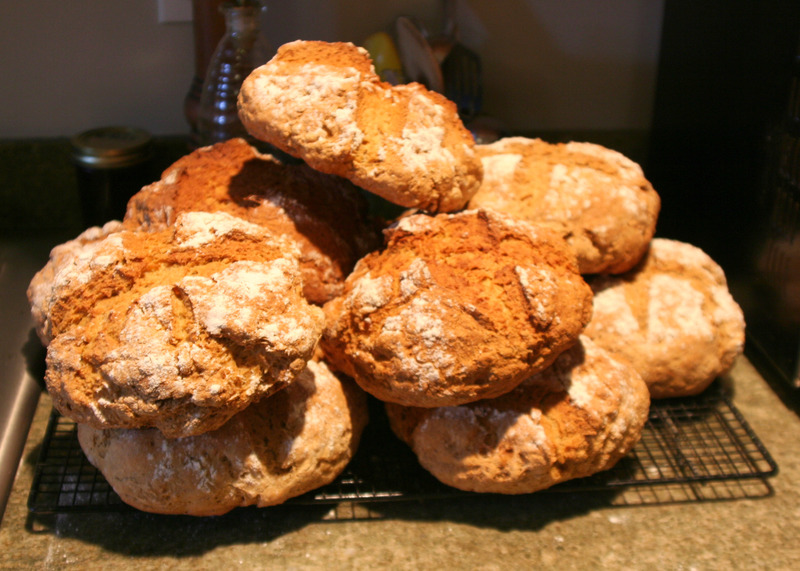 So, with Saint Brigid in mind I mixed and baked, hoping that the now sixteen loaves I was baking would be enough. By 7 am everyone was awake, and the loaves were stacking up on the cooling rack. I shifted and squeezed bread into all corners of the oven, and when we were finished, and dressed and ready to head out out the door, I counted the loaves as I placed them in brown paper bags. Twenty loaves. A blessed Saint Brigid’s Day everyone! This entry was posted in Fifth Century Baking, On Baking, On Giving and tagged Irish soda bread, miracles, Saint Brigid by janegmeyer. Bookmark the permalink. I bet everyone gobbled it up at church! Sounds wonderful! Wow! Your blog is very inspiring and yummy! I am from Australia and was wondering if you can email me this recipie for the 20 loaves? Many thanks and keep up this blessed job of feeding others, especially bread which is so blessed!